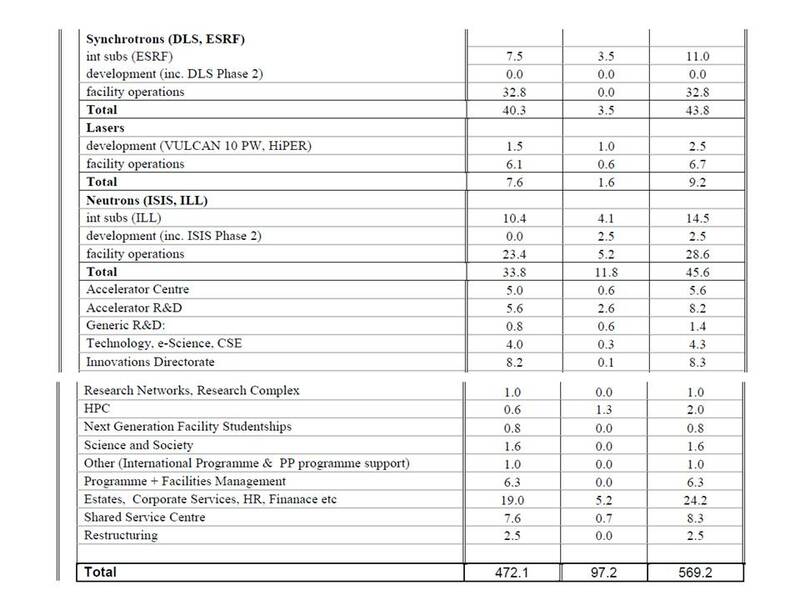 Just a quick post to point out that the Science and Technology Facilities Council have released a reasonably complete breakdown of their current budget. I’m sure many readers working in astronomy and particle physics will find it interesting reading, though others will probably find it incredibly boring. For those of you not up with the accounting lingo, “near cash” means assets investments and other things that could in principle be exchanged for cash in a relatively short period of time. These are, of course, the figures before the impending cuts take place…. There’s a much more legible version of the whole thing here. This entry was posted on October 14, 2010 at 10:38 am and is filed under Finance, Science Politics with tags astronomy, Particle Physics, STFC. You can follow any responses to this entry through the RSS 2.0 feed. You can leave a response, or trackback from your own site. what science gets done under the ESA subscription? My understanding – and no doubt STFC experts will correct me if I’m wrong – is that the line marked “ESA subscription (ESA AURORA)” is not the full subscription for belonging to ESA, which is much larger than the figure quoted above, and which is now transferred to UKSA. 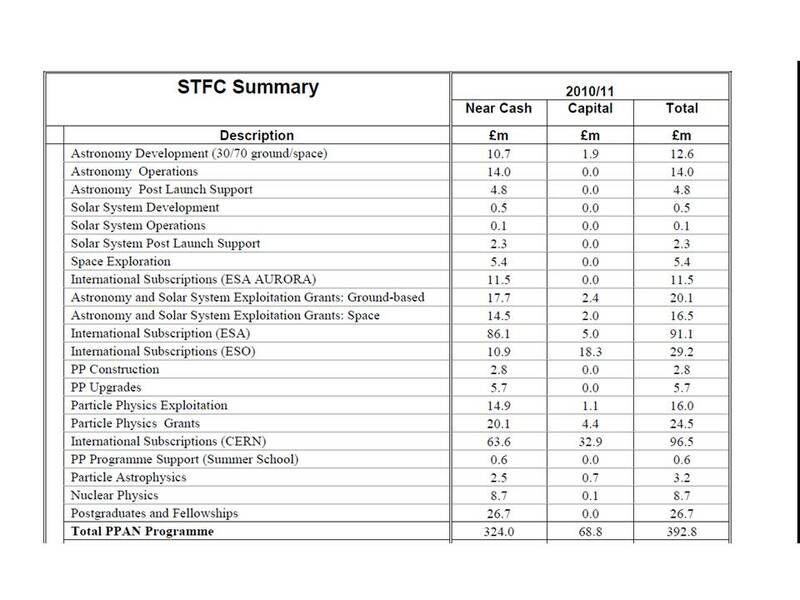 It looks to me like the bit remaining in STFC’s budget is to do with the AURORA programme which is to do with Mars exploration and associated “science”. Not an expert in anyway what-so-ever, but in response to the bit by Mat Roberts, I note there are 2 separate entries 1) “International Subscriptions (ESA Aurora) – 11.5M”, and 2) “International Subscription (ESA) – 91.1M” – so the 2 seem to have been separated? nope – i think STFC retain the additional Aurora contributions as its “exploitation”. but i’m sure someone from STFC can confirm this (i know they’re reading this). Ian, you are correct the second time around. Both the ESA subscription and the additional Aurora line go to UKSA, as do all other space-related items, with the sole exception of that part of the astronomy grants line that is associated with the exploitation of space science ativities. In the CSR, it is UKSA rather than STFC which is bidding for these over the period 2011-14. So I coloured in the items I interpret this as saying has transferred to UKSA in the google version. Let me know if I did it wrong. which would affect STFC’s choices in the face of any large budget reductions. yup, more or less 20% of total STFC budget shifts across to UKSA from April 2011. Good riddance to ESA subscriptions but flexibility is also reduced. Reminds me of Richard W many moons ago arguing that PPARC + CCLRC = STFC meant that bigger was better (more clout). If so, clout will diminish from April (£570m -> £455m for flat-cash w.r.t. 2010/11). As John W notes, grants remain the responsibility of STFC. Osborne announced ‘infrastructure’ cash from LFCF (Capital Fund) will go towards Diamond upgrade. Different pot of money from individual RC’s, but part of RCUK budget. The Drayson plan for STFC was always to separate Harwell operations (Diamond, ISIS, CLF) from the rest of STFC programmes, so support for Diamond upgrade is likely to come with operations cash too. Putting these two items together, STFC allocation will shrink and some of the remaining cash is going to be ring-fenced for Diamond operations. Lets assume that (non-QR) near-cash Science Budget were to fall by 20% (30% in real terms) on Wed 20th and capital investment falls by 50% (scenario C in John W’s slides from Astro Forum). Should operations for Diamond remain unchanged and STFC not do worse than “average” (ever the optimist! ), cash+captial for the rest of the non-USKA programme at STFC would fall by 25% or so, i.e. approx one hundred meeelion pounds less to spend per annum than at present. In practice this might mean.. Stopping all accelerator R&D (£8m). ..or some other equally hideous combination thereof, in Richard W’s spreadsheet. Headline CSR science budget might be announced on Wed, but details for STFC likely to be deferred until just before Christmas. *UK locked into ESO until 2015(?) so large penalties would need to be paid.. deja vu re: early withdrawal from Gemini 3 years ago. the worst case (scenario C) would mean a combination of those too-horrible-to-contemplate outcomes. But the latest vibes, gossip, informed speculation doing the rounds is closer to a 15% real reduction over four years (eg, using Treasury’s possibly heroic CPI forecasts around 4-5% in cash terms). Incidentally that’s roughly the same budget reduction CERN council agreed a few weeks ago. Capital outcomes still unknown — great for Diamond it gets the Large Facilities Capital Fund money already allocated by the previous government, but no word still on the vitally important LFCF money for Phase II of ISIS Target Station 2, or for Hartree or ESRC-MRC Birth Cohort study etc. Whether a 15% cut is the result we may know Wednesday — or then again, may not. Still arguments within government over whether a science budget (ring fenced or otherwise) is included in the overall CSR — it would reduce BIS’ flexibility elsewhere, for example. Even when we know our allocation, and can get Science Board advice on priorities, the impact on research won’t be known until the universities have been able to assess whether fees can make up for the impact of the huge cuts to public funding, and what sort of deal science gets in that respect. The prospect of unintended consequences is high because our budgets run from 2011 but the tuition fees change won’t occur until 2012. STFC and EPSRC recognise this and know we need to engage ASAP with VCs and dept heads but we’ll be operating on very tight timeframes to meet the BIS requirement of mid-December Delivery Plans! And that’s without any “political considerations” that government may impose. Please use the comments there for reactions concerning the likely effect of cuts on the scale being discussed here.